I have been chomping at the bit to share some exciting news, and today I finally can! 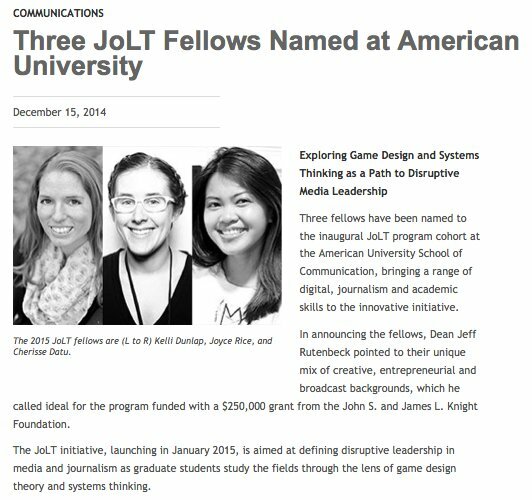 I was notified earlier this month that I had been selected as one of three fellows in the ground-breaking Game Design and Persuasive Play initiative at American University. This is a Masters program focusing on disruptive leadership, game design thinking and leadership, and media innovation. All the details about the program can be found here. Each fellow received a brief little feature as well. As part of the application process, I also had to complete a brief video intro, which can be seen here. I completed my undergraduate degree at American, so there is definitely a bit of nostalgia about going back. But mostly I am excited and so incredibly grateful for this opportunity. I will get to work alongside some of the best in the field of games for change / social change games and develop an entirely new skill set. I am definitely not turning my back on my psychological background, but hopefully through this new program I will be able to draw on and share that knowledge in new, “disruptive” and innovative ways.